From November 15th, 2014, Qixia television station in Nanjing, Jiangsu province started to provide sign language interpreting in the weekly news programme Xiao Rui Shuo Xin Wen (Xiao Rui (name of the hearing news presenter) Presents the News). The programme received immediate applause from the deaf community all over the country and the academia. There are a few reasons for this. To start with, the interpreter, Ms Dai Manli (name in Chinese order), is Deaf. Although in the past, there were deaf interpreters on television occasionally, this is the first time that the interpreter was encouraged officially to use natural Chinese Sign Language with clear facial expressions as opposed to the past where interpreters were required to wear a smile all the time and use signed Chinese, which is an imposed sign system based on written Chinese syntax with a lot of signs created on the basis of Chinese characters, very unpopular amongst the deaf Chinese community. Moreover, this particular programme, unlike many other programmes with SLI, takes into consideration the feedback from the local deaf community. For example, when first broadcast, the size of the interpreter screen was as small as it was in the past, which was not easy to watch for deaf audience. After taking into consideration the feedback, the TV station enlarged the interpreter frame to its current size in the second week. Indeed, the current size is far from ideal if compared with that of the SLI frame in BBC news, but it is still regarded as a positive sign by the audience. 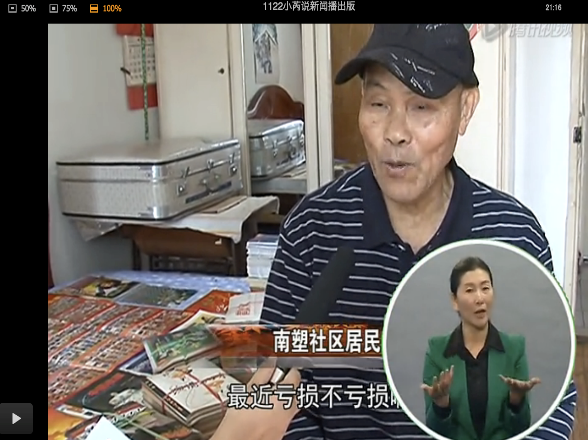 Last but not the least, in order to reach a wider audience in China, Qixia TV station edits a special version of the programme and publishes it on its Wechat account (similar to Facebook) and on mainstream video websites. As a result, deaf people in other cities in China can easily access it on the web. Almost at the same time, Suzhou TV station, also in Jiangsu province, invited two deaf people to work as interpreters to try out their SL interpreted news programme. These two programmes are especially valuable in the context of nationwide downplay of natural CSL in special education schools and TV stations. We hope that more TV stations and, more importantly, more government leaders will follow the lead and provide quality service to deaf Chinese citizens soon.